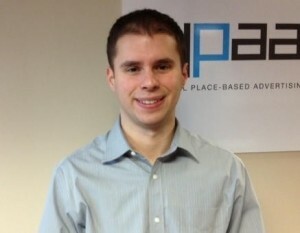 Gregg Braff has joined New York-based Digital Place-based Advertising Association as manager, member services. succeeding Noah Klas, who recently was promoted to director, member services. “Gregg’s background in various aspects of customer and member relations will enable him to hit the ground running and make an impact on our support services,” says Susan Danaher, president and CEO of DPAA. Braff joins DPAA from Pearson Education, where he was a media assistant in the higher education department. In this role, he assisted Pearson editors around the country with support on a wide range of projects. He earlier worked as an assistant editor at Pearson, responsible for uploading and maintaining content for the company’s American history online course for high schools. Braff also worked in member services at the BergenCounty Y in New Jersey and as a middle school/high school teacher. This entry was posted on Saturday, December 15th, 2012 at 10:00 @458 and is filed under Scuttlebut. You can follow any responses to this entry through the RSS 2.0 feed. You can leave a response, or trackback from your own site.